Hi friends, so how was your Christmas? Hope you all had a blast. Now let’s welcome New year with this healthy baking – Whole Wheat Mango Cake – Egg less, Butter less. If you are following this space, you would have noticed that I’m in a baking spree recently. I don’t know how but I have been baking a lot than before. So when I was thinking what to bake for New year,this Mango cake idea popped. I have earlier made Whole Wheat Banana Cake and it was a hit in our family. I thought of making it in Mango flavor as it was our family favorite. This is obvious from my these posts, Coconut filled Mango crepes, Mango Yogurt Parfait, Mango Jam, Mango Pistachios Smoothie, Mango Lassi still lot more. From this, you should not be surprised why did I chose to bake Whole Wheat Mango Cake. As I said earlier, I adapted this recipe from Egg less Whole wheat Banana Cake I made( will update that recipe also soon). Both this mango and banana cake became our kids favorite and my daughter would ask me to pack that in her snack box. So why stop? Just grab the ingredients and start baking.You will fall in love with this Whole Wheat Mango Cake – Egg less and Butter less. To make this cake egg less,I used Coconut Oil. You can use Olive oil too. The sweetness is mild,the way we liked. But you can adjust sugar as per your requirements and the sweetness of mango. If you like any of my recipes and gave a try please tag me #CookingwithSmile on Instagram. I will follow you and share your photos. Pre – heat oven to 350 Deg F.
Sift Whole wheat Flour,Baking powder,Baking Soda and salt in a bowl. In another bowl take Coconut oil and sugar and mix till the sugar dissolves. Then add vanilla essence,Mango puree and mix thoroughly. Then add flour slowly while mixing till all the flour mixture is fully incorporated. The batter will be little thicker. Pour the batter in a greased pan and bake it in pre heated oven for 25 – 30 minutes or till inserted tooth pick comes out clean. Serve. This can be stored in refrigerator for a week in air tight container or wrap in cling wrap. You can adjust sugar as per your requirements. I used Fresh Mango Puree. You can also use store bought. Pre - heat oven to 350 Deg F.
Pour the batter in a greased pan and bake it in pre heated oven for 25 - 30 minutes or till inserted tooth pick comes out clean. Sharing this recipe to Fiesta Friday this week co hosted by Sandhya. 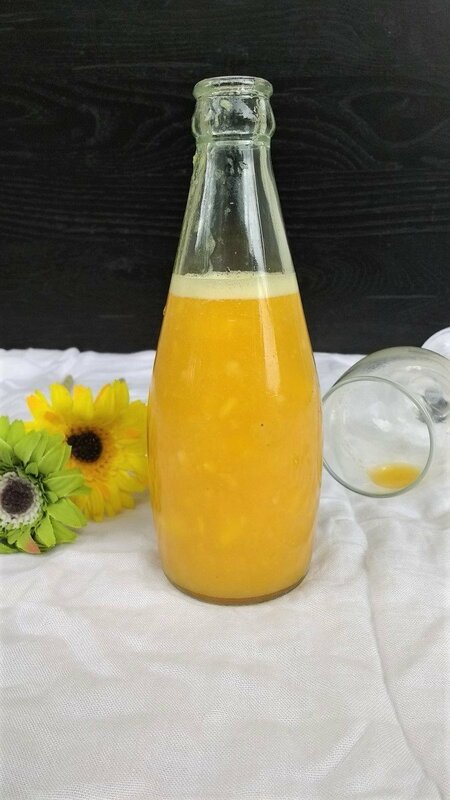 Mango recipes always welcome! Loving this exotic and delectable cake that too made with wholewheat..! Yay! This is delicious. I am sure of that. I love mango in many ways. Thanks for sharing your recipe. I will share this in my cooking fb page. I want a slice of this right now! 😀 Looks so yummy! I love mangoes in any form 😉 the mango cake looks so delicious 👌 glad to see it’s made with while wheat! This cake looks so yummy and I love that there are no eggs in it! I’ve pinned it to my board for later! Thank you! Lathiya Happy New Year! 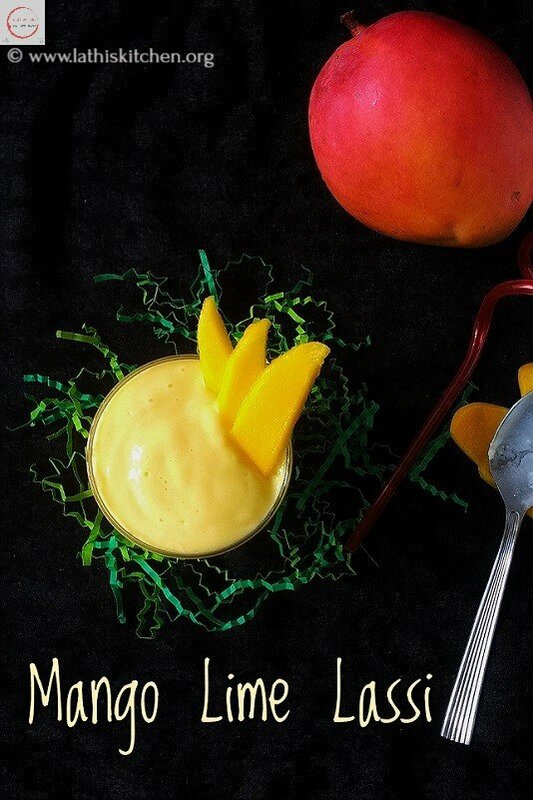 This sounds intriguing – we love mango but all we’ve ever done is eat them fresh! I think we’ll have to have a play this weekend! Thanks for sharing at FF. Yummy. This sounds light, healthy and delicious! I love mangoes, so I have to try baking with them! This looks so yummy! I’ve never baked with mango before – you have me intrigued! Mango cake is such a great idea! and this recipe looks really healthy. Coconut+ Mango= meant to be!!! I would make a sweet coconut cream to top it with, I bet it would be super tasty. Wish I were back in the tropics, I kind of refuse(or try not to) use anything that’s imported from another state/country. We had mangoes overload every summer back in Taiwan, this recipe would’ve been perfect. The pan that you used is super cute! and this recipe uses all the ingredients that I love. I want to try it with almond flour! I absolutely LOVE mangoes! This recipe looks amazing!! Mangoes are my favorite fruit ever. I can’t wait for Mango season. My mother in law has a tree in her backyard and we get tonssss of them. This will be a perfect recipe to use up some of those mangoes. This sounds delicious! I’ve never had mango in cake before. This would be perfect as dessert, afternoon treat and a great brunch menu item too. Mangos are so delicious….and even the frozen ones work in this too. Yum I love mangoes! I have never thought to bake with them before – did you make the mango puree yourself or is this something you can buy that I’ve just never noticed in the shops? This sounds refreshing and delicious! And a healthier option to a regular cake! This sounds wonderful! I love mangoes but have ever really thought to put them in a cake! Sounds like a great dessert or breakfast! This is so pretty! Love the pan that you used, too. I can’t eat wheat, but I have a family member who would LOVE this recipe. This design is beautiful! I love mangoes, but have never seen it used in a cake… great idea! It must be so moist and delicious! Mango is my absolute favorite and I imagine the taste of it really shines through in this cake with a touch of vanilla to enhance the flavor. Yum! These flavors look so good! Unfortunately I can’t have mango, sugar or flour but this would be such a wonderful dessert to bring to a pot luck. Lathiya, I absolutely love this cake! Not only does it look stunning, but I also like the flavors and the fact that it is butterless and eggless! Love using mango when baking, it really gives a refreshing and tasty flavor!